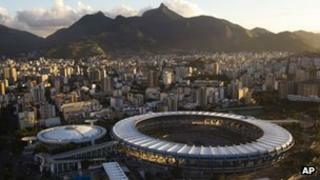 Football's world governing body Fifa has expressed concern about Brazil's preparations for the 2014 World Cup. The construction of stadiums, transport infrastructure and hotels for fans is behind schedule, said Fifa's general secretary Jerome Valcke. He added that Brazil appeared to be more concerned with winning the World Cup than organising it. Mr Valcke said there was no "Plan B" for an alternative venue, but warned that fans could suffer. "I don't understand why things are not moving," he told reporters during a visit to London. "The concern is that nothing is made or prepared to receive so many people, because the world wants to go to Brazil. I am sorry to say but things are not working in Brazil," he said. He added that organisers needed to give themselves "a kick up the backside" to get things ready on time. The Fifa general secretary also expressed frustration at delays in approving a law setting out the regulatory framework for the World Cup. The World Cup bill - currently being considered by the Brazilian Congress - would lift a ban on alcohol sales in stadiums and limit discount ticket sales to students and pensioners. But it has been opposed by lawmakers who say it gives Fifa too much power, as well as those who are against alcohol sales in stadiums on health and safety grounds. The Brazilian government has always said it is determined to deliver a successful World Cup as well as a lasting legacy. It is investing billions of dollars in building new stadiums and renovating old ones, as well as in transport infrastructure such as roads and airports. The 2014 World Cup will be the first in South America since Argentina hosted the tournament in 1978, and the first in Brazil since 1950. Correspondents say most Brazilians are confident they will make a success of hosting the tournament, especially as they have won it five times.